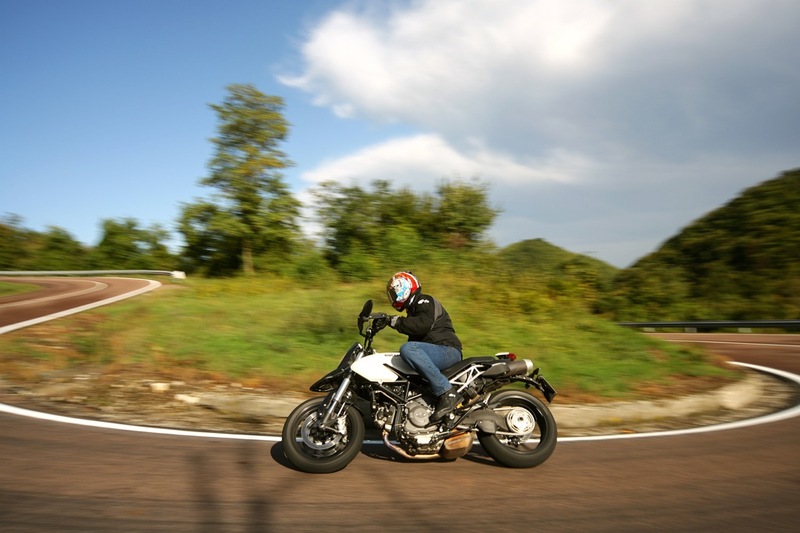 European roads and a new Hypermotard 796. Joy! An upright seating position, unless you’re cranking. 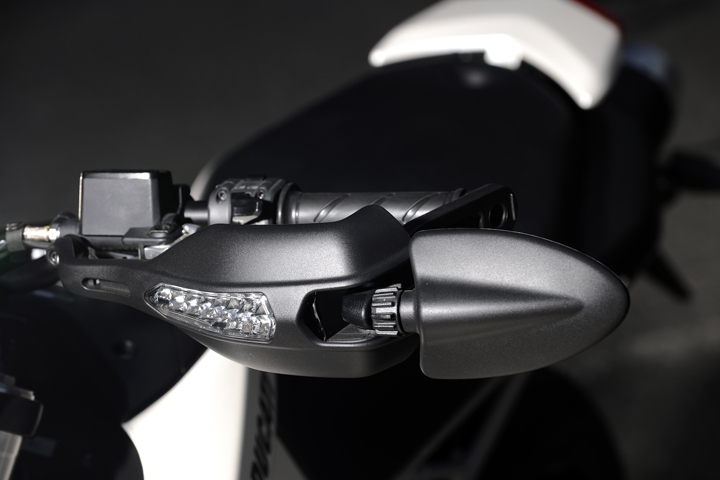 2010 Hypermotard 796 Folding Mirror and Hand-guards – grateful for the protection. Bologna, Italy, and we were suiting up to ride the new 2010 Hypermotard 796, just tens of feet from where it left the factory doors, in the courtyard of Ducati’s world headquarters. A row of white and matte black 796’s awaited under a tent, shielded from the bright sunshine. A glance at the cloudless, blue sky confirmed the weather forecast, which called for sun throughout the day with no chance of rain and temperatures in the mid 70s Fahrenheit. All the elements were in place for a wonderful ride through the Italian countryside: a new motorcycle designed to attack winding roads, miles of serpentine tarmac waiting for the assault, and of course the splendid weather, which we were told was unusually clement. 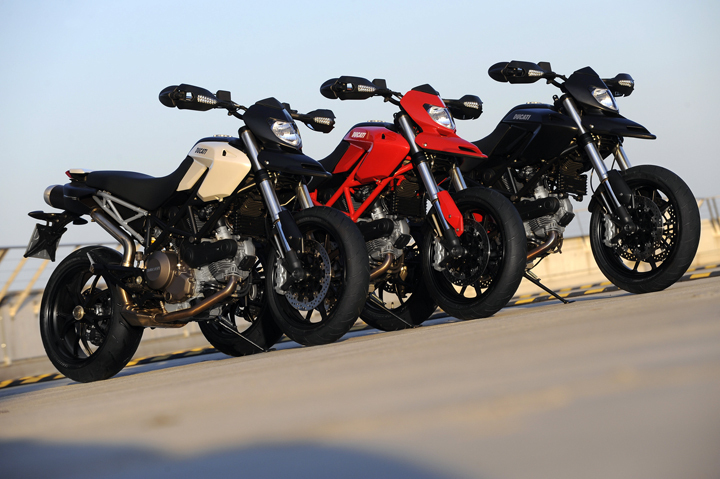 If the number’s in the name didn’t give it away, I’m this is the media introduction of the Hypermotard 796, Ducati’s smaller-displacement version of the 1100 mega-motard model launched in late 2007. 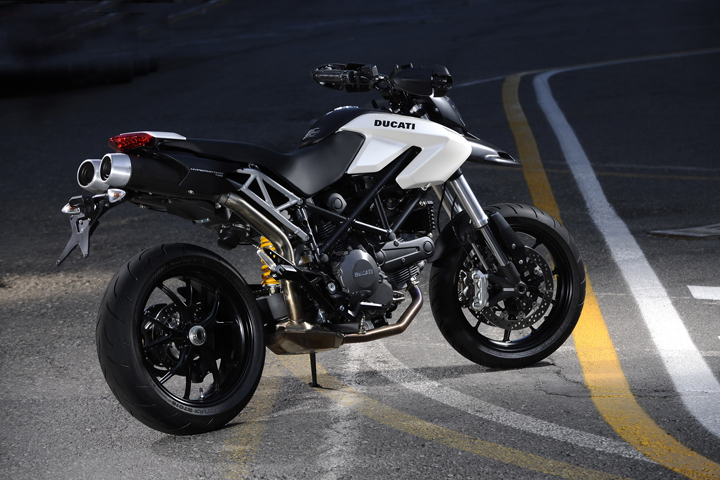 With the introduction of the new Hypermotard, the Italian motorcycle maker wants to expand on the success of the Hypermotard 1100, a model that has come to represent 10 percent of new Ducati sales in North America. Despite rumours that the 796 would borrow the motor from the Monster 696, it has an entirely new engine. The air-cooled, four-valve V-twin actually displaces 803 cc and though it uses the same bore as the 696, it has a longer stroke (66 versus 57.2 mm), resulting in 5 lb-ft boost in peak torque, that arrives 1,500 rpm sooner (max output of 55.7 lb-ft @ 6,250 rpm). Claimed horsepower is 81, an impressive number when considering BMW’s F800 twin pumps out just a handful more horsepower using liquid cooling and eight valves. Service intervals are at every 12,000 km. Despite a smallish 3.3 gallon (12.4-litre) fuel tank, Ducati says the Hypermotard 796 is the most fuel efficient bike in its lineup, claiming 59 mpg (4.8L/100 km). Given the fuel efficiency that tank size isn’t as disastrous as it sounds and should be enough to make most Hypermotard 1100 owners jealous – Ed. Weight has been reduced on various components including the tripleclamps, fork bottoms and frame (the crankcase alone weighs 2.65lbs/1.2 kg less than the 696), contributing to a claimed dry weight of 368 lbs (167 kg), 26.5lbs (12 kg) less than the Hypermotard 1100. Upright seating combines with unusually wide handlebars to provide a dirt-bike-like riding position, though a new seat drops seat height .8 inches (20 mm) lower than the 1100 to 32.5 inches (825 mm). Ample seat foam provided enough comfort for a painless journey during our 130-km loop, though I suspect a longer stint in the saddle would eventually take its toll. Visually the 796 and 1100 are nearly identical. Probably the biggest distinguishing feature is the bulbous pre-muffler located beneath the 796 (which contains a catalytic converter and dual oxygen sensors), though more subtly, and to keep costs down, the 796 uses a tubular steel handlebar, as opposed to the other bike’s tapered aluminum handhold. I love riding in Europe, not only because the area is steeped in history and abounds in visual splendor, but because Europeans ride the way we should: hard and fast. 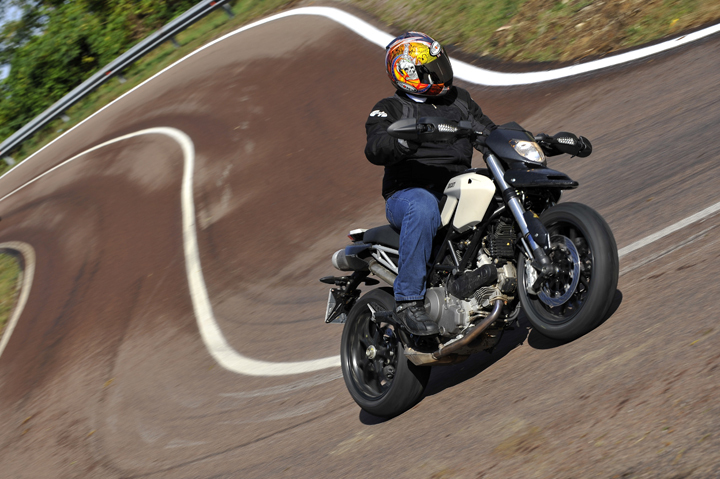 Within 10 minutes of leaving the factory’s parking lot, I was pitching the 796 into tight hairpin turns arcing through stone roadway arches barely wide enough to allow a midsized car through. The Hypermotard felt perfectly comfortable in these cramped corners, as it should being the engineers that built it probably used these same stretches of blacktop to develop the bike. We meandered about the Italian countryside heading south out of Bologna for about one hour when the sky got menacingly dark. Then, as Italy’s weathermen laughed it up, the skies opened up and it began to rain … then it poured. Although most everyone brought raingear to the launch, no one brought it on the ride, as the puckish forecasters had duped us all. To add insult to injury the temperature dropped from the low 70s to the chilly 50s. Being professionals with a job to do we soldiered on through this freakishly unexpected monsoon, while gusting winds blew leaves and branches from trees. Okay, we had no choice but to continue as there was no immediate cover available. Shaking uncontrollably and on the verge of hypothermia, I cursed myself for leaving my rain gear neatly folded in my luggage back in the changing room at Ducati HQ. I was, however, relieved to discover that the stock Bridgestone BT015 radials displayed excellent wet grip. Also as a consolation, the hand guards that double as turn signals provided a small measure of wind protection for my now sodden, leather-clad claws. We eventually stopped for a late lunch and waited out the storm, which fortunately dissipated as quickly as it appeared to reveal blue skies once again. After the lunch stop, we picked up the pace. I then began to truly appreciate the new engine’s more subdued, but ultimately very engaging powerband. 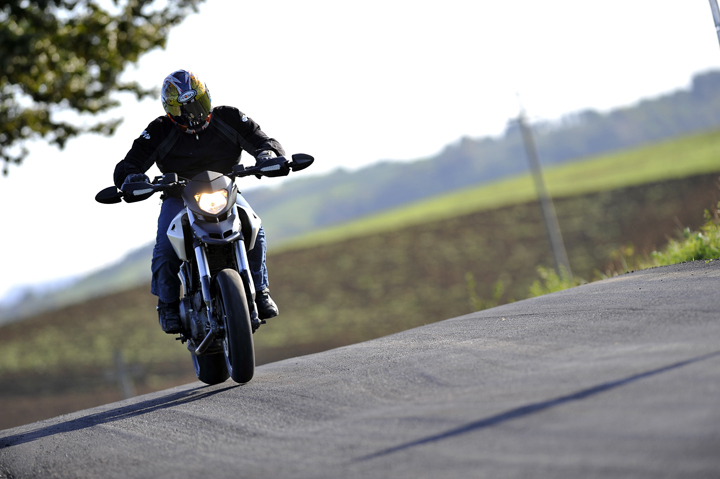 Although just nine horsepower down on the 1100, power delivery is much smoother with fluid throttle response. Yet there’s enough low-end grunt to allow the engine to easily pull a taller gear, thus allowing a numbed foot drowning in a boot full of cold rainwater to neglect shifting gears on occasion. 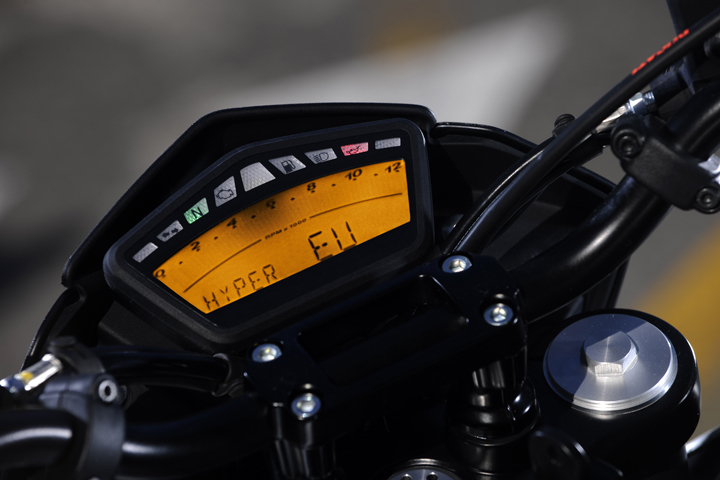 Gear ratios are lower than on the 1100, as is the final drive ratio, making the 796 easier to launch from a stop, as well as shudder-free in top gear at 68mph (110 km/h). This compares favourably to the 1100 which needs to be ridden faster than 75mph (120 km/h) to experience a smooth ride in top. 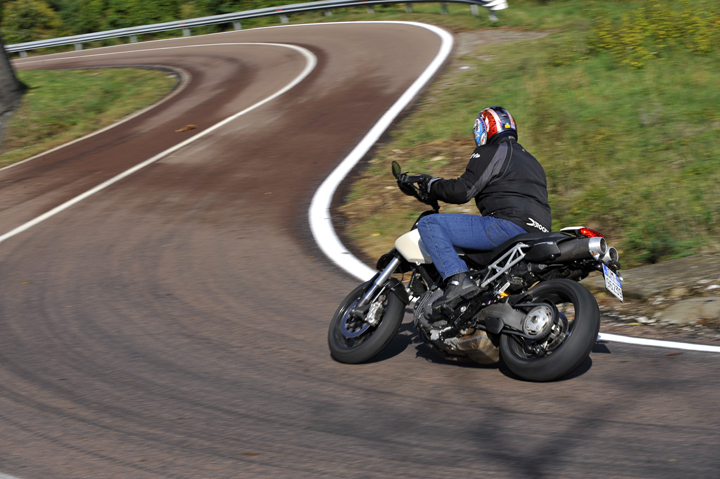 For riders with a streak of hooliganism in their genes, they may be a tad disappointed to find that wheelies aren’t as effortless as on the 1100. Having said that, clutchless lofting of the front wheel is quite easy in first gear, and with clutch assistance the front lifts in second gear on flat surfaces and in third gear over humps in the road. A rigid 43 mm, Marzocchi inverted fork is non-adjustable, while the Sachs shock absorber has provisions for spring preload and rebound damping adjustment (the 1100 has fully adjustable suspension). Suspension settings were a bit too soft for me at a sporting pace, especially since the machine had to carry my waterlogged body. The rear end wallowed a tad through some of the tighter turns, where it was under a heavy load, and the fork sometimes soaked up all of its travel when braking hard. I could have cranked up the rear rebound damping, which would have improved rear-end control, but I was still too wet and too cold to care. Abundant cornering clearance allowed me to confidently pitch the bike low and deep into the apex of a corner, dirt-bike style, with my body poised upright and knees tucked in. The wide handlebar provided the necessary leverage to pick the machine up quickly at corner exit without making the steering overly sensitive and prone to instability. That handlebar width, however, made dodging slow-moving Fiat Pandas somewhat dodgy in town, especially with the unique bar-end mirrors threatening to clip the boxy utilitarian cars in tight quarters. Although not entirely practical for threading through tightly packed urban traffic (something I dare only when I’m abroad – where it’s tolerated), the mirrors provided an unobstructed rear view. When in town, I got into the habit of folding the mirrors back for added clearance. Steering lock sits on the borderline of being too limited, with just enough wheel angle to make a straight-through U-turn if the start and end of the U are as close to the road’s shoulders as possible. Brembo radial brakes provided eyeball-bulging stops with light, easily modulated lever pressure. The rear brake was just how I like it with a firm pedal that needed considerable effort to lock the rear wheel. A moderately light-effort APTC wet slipper clutch did away with any rear wheel chatter on those forced corner entries. 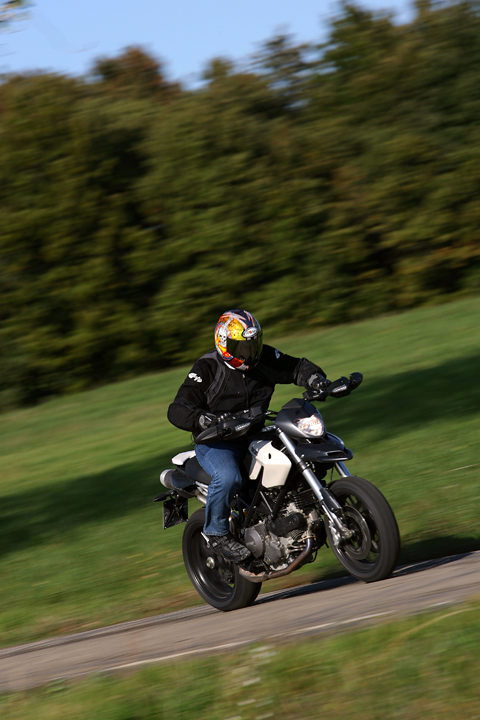 I liked the Hypermotard 1100 when I’d first ridden it, but its firm suspension and high price left me a tad cold. By the time we’d returned to Ducati HQ I had warmed up to this new, more accessible Hypermotard (I had also personally been blown dry). Decreasing engine displacement by no means diluted the Hyper experience, and in fact, for me it enhanced it. With its more controllable powerband and lighter weight the 796 proved more user-friendly and manageable, and despite budget suspension components, the softer ride was more tolerable than the racetrack-ready suspension on the 1100. 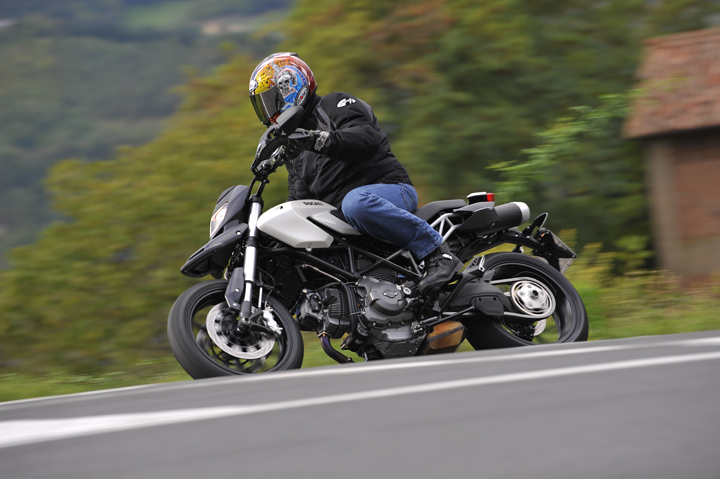 These factors should make the 796 more appealing to fledgling Ducatisti, as should its $9,995US ($11,495 CND) price tag, which is a $2000 ($3,500CND) less than the 1100. Post ride, there was one last thing I needed to do. I’d seen the Ducati museum (located at the factory’s entrance) on the morning of our test ride, but I would have never forgiven myself if I’d left Bologna without seeing the factory from the inside. John Paolo Canton, PR coordinator for Ducati North America, graciously offered to give me a personal tour of the premises the following day (I begged, actually). Inside the factory, I was surprised to see that all Ducatis are still hand built; there were no robots in sight. Frames came from a supplier up the road, as did engine castings, but all assembly was hands-on. Also surprising was the section of the factory that looked like a big service bay, replete with bike lifts, tools and electronic equipment. Here, each machine was started up and manually tuned by a technician before heading to the dyno for final testing and subsequent shipping. In a time when the urge to be productive and profitable outweighs the importance of maintaining jobs, seeing such basic principals being applied in a modern assembly plant gave me a better appreciation for Italian bikes, and their occasional idiosyncrasies. As for those ungrateful Italian weather forecasters: may the rest of their days be spent commuting to work in 1980s-vintage Fiat Pandas. Next Post Harley-Davidson Turns Out the Lights on Buell and its Future?